A strategy + research unit that helps companies keep pace. I was invited to speak at the AQR's conference in Valencia in May. I've reproduced my talk here since so many have asked to see the it. It's one of those presentations that's more pictures than words so I've included my notes to help it make sense. That’s the title of this afternoon’s segment. But, for all the attention Behavioural Science and System 1 Thinking has been getting, has it really led to a revolution in the way we plan and activate comms? Let’s take a moment to step outside the bubble of a conference dedicated to consumer research. 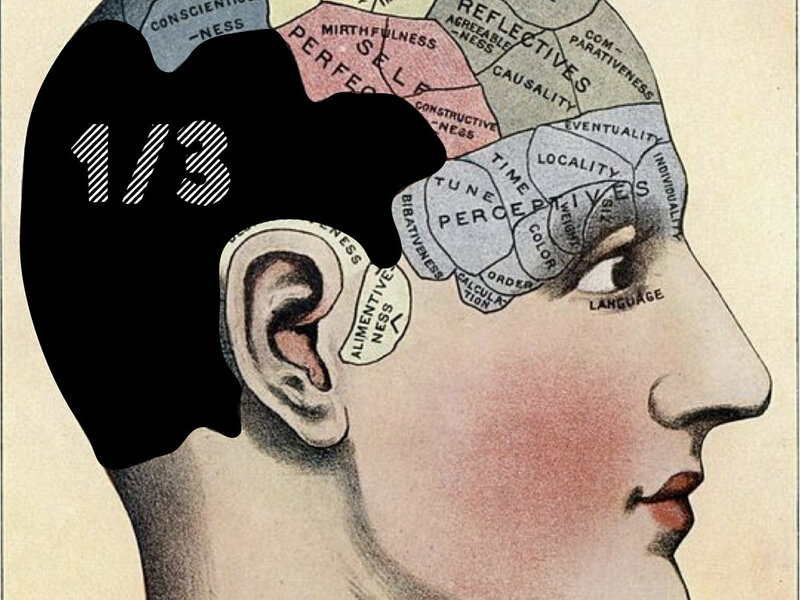 How “mainstream” has behavioural science really gone? Probably quite a few people own a book on it. Why is it that most practitioners outside this room - and probably quite a few of us in it - would struggle to give even one solid example of having consciously applied System 1 Thinking to a comms brief? We can’t claim it’s because the whole area is still too new. The ideas are based on theories that go back to the beginning of neuropsychology, and in terms of making it accessible for all, books like Predictably Irrational and Nudge came out a decade ago. The first, and the one I feel I experience as a barrier most often, is complexity. System 1 Thinking sounds so straight forward: ‘people don’t always make decisions with the rational bit of their brain’. Easy. But as soon as you get to the question of how they do make decisions, hundreds of cognitive biases and contextual stimuli come into play. Which ones matter? Which ones do I need to know about to write this brief, evaluate this campaign? Ultimately, when it comes to applying it, for many Behavioural Science still feels like hard work. There’s also scale. Not of the idea itself but of the ideas it produces. We are in an era of BIG: big data, big cultural shifts, big changes in technology. There’s a reason the conference organisers decided to call this segment BIG ideas - BIG is in. Yet the solutions offered by Behavioural Science can sometimes feel a little… small. A tweak to your media to take account of the concept of ‘Priming’. Linking your website to Feefo to provide Social Proof. Of course, these kind of small wins can make a big difference to the bottom line. But if we want this to be a Big Idea we need to start using Behavioural Science to tackle the core challenges facing modern brands, not tinker round the edges of performance. Too often, when Behavioural Science is introduced into the conversation it’s in the context of adjustments to the execution, not insights that should shape the strategy from the start. Which leads into a third issue: empowerment. Behavioural Science gives us a deeper understanding of why people make the decisions they do. More understanding is supposed to lead to more influence over those decisions. Except, a lot of the time what Behavioural Science actually tells us is that we have very little influence. Opportunities to change people’s minds are narrow. Biases are so ingrained it takes a mountainous media budget to shift them. Compare this to the ‘Big Ideas’ that have truly changed comms and marketing culture in recent years - the ones that have gone seriously mainstream. They are a lot less technical and a lot easier to get your head round. You don’t have to have read a book to make a pretty good stab at what ‘Fame’ could mean for the way your brand behaves, or understand any technical terminology to see how a ‘Brand Purpose’ - Persil, what is our bigger mission - could inform briefs from traditional comms to content to experience. Those are ideas about how comms work. Behavioural Science is an idea about how people work. That is, of course, its biggest strength. Concepts of communication will come and go with fashion. Understanding how people work offers a more permanent basis on which to build strategy. So today I’m going to give you an example of how we went about that, in the hope it will inspire you to find your own ways of doing it. Standout. The word advertising comes from the Latin advertere - to turn towards. 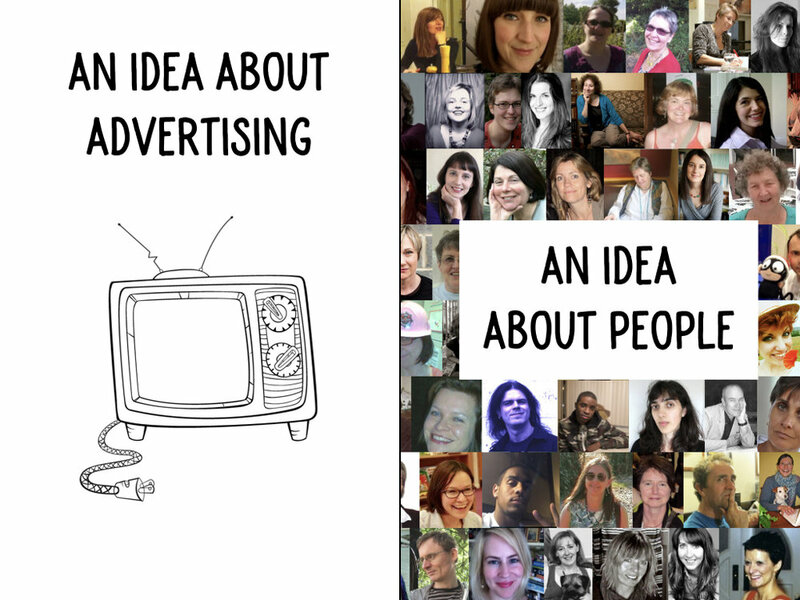 At it’s most basic advertising is about getting people to look at you. But probably the hardest job facing marketeers today is simply to get noticed. 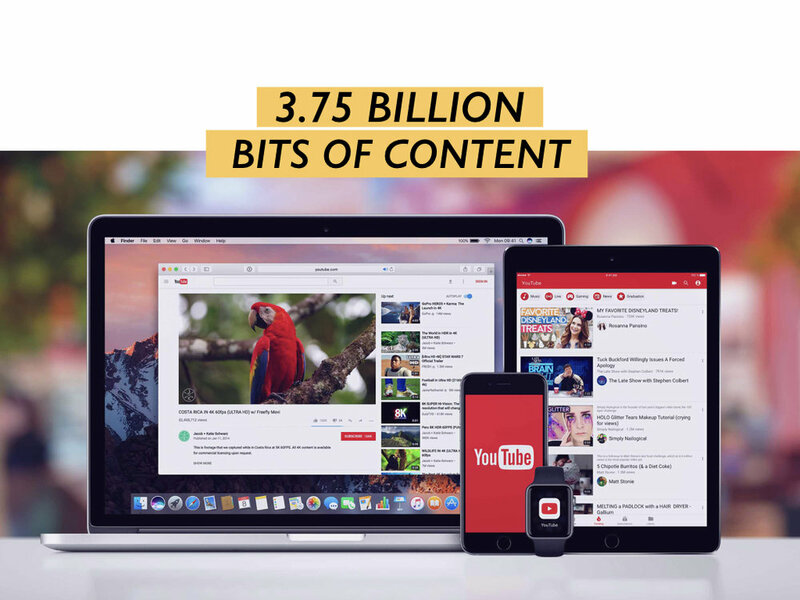 But it isn’t just the volume of content consumers are offered that makes cut through such a challenge, it’s the nature of that content..
To a certain extent, advertising used to be entertainment. Something to look at while you were waiting at the bus stop. With the advent of mobile and wearable tech, that role is now arguably pretty unrealistic. How can you possibly be more entertaining than Netflix? It’s because Stand Out is such a fundamental challenge for brands today I really believe it’s the one that will allow us to prove the value of behavioural science and System 1 Thinking to the marketing community. 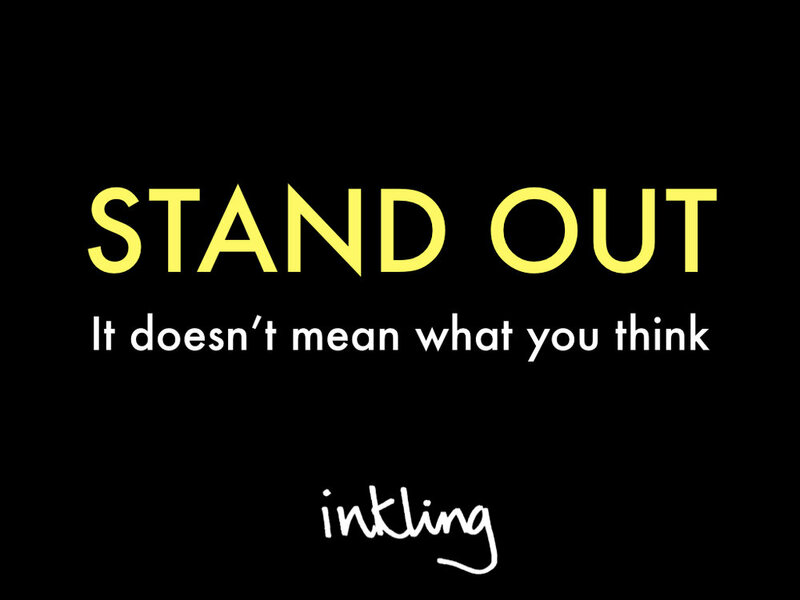 Obviously, when we talk about stand out we are NOT talking about getting seen. Humans SEE almost everything that is falls into our field of vision. What we’re really talking about is getting processed. 1/3 of the brain is devoted to processing what we see. And processing in this instance, mainly means filtering. There are 100 million cells involved in deciding what to filter out from the information our eyes put in. Or in other words, 1/3 of our brain is dedicated to telling us what to ignore. An understanding of how our brain does that is invaluable. But how to integrate a conversation about brain cells and neurology into conversations with clients about how to make better ads. One option is to point out all the many, many specific biases and cognitive processes that are involved in how humans filter information. And that is where a lot of the popular conversation around Behavioural Science is at the moment. 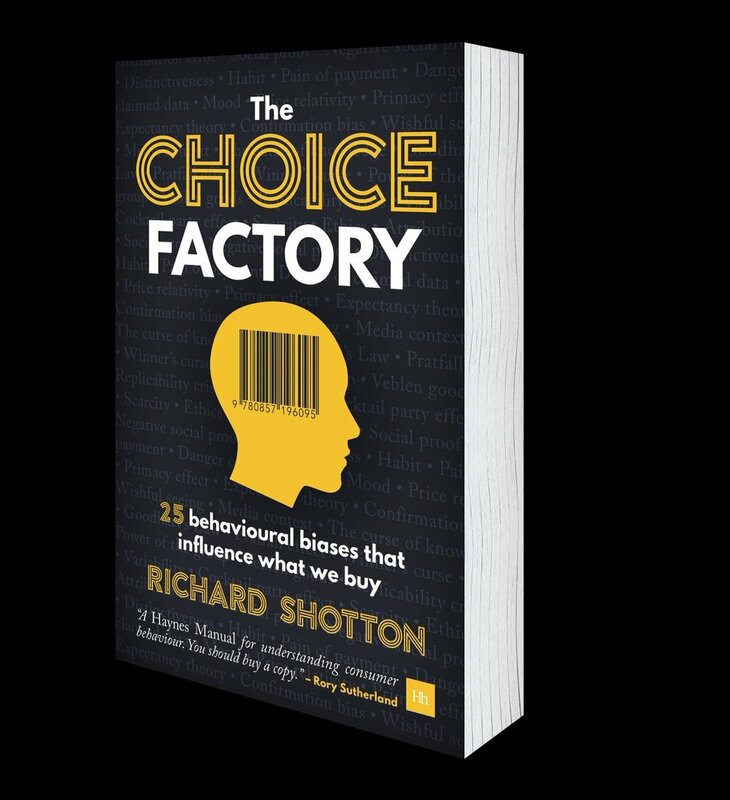 Think of books like Richard Shotton’s recent Choice Factory. Inkling’s model was designed to be simpler. In truth, it’s really very simple - and we make no apologies for that. What we were looking to do was strip the conversation back and avoid getting mired in the nitty gritty that has dogged discussions about System 1 theories. 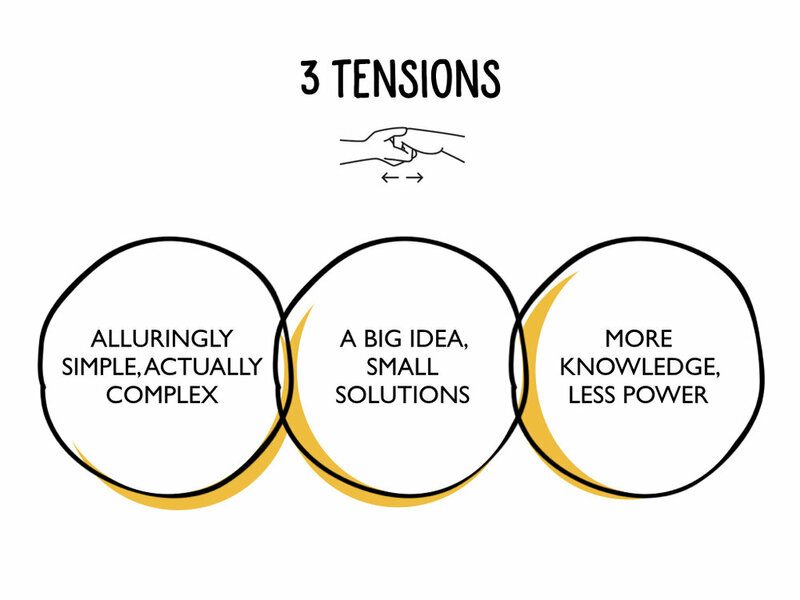 We’ve synthesised the many individual theories that have implications for standout into three essential considerations: Expectation, Mission and Triggers. It’s a model we’ve developed over a number of projects, ranging from comms, to packaging briefs to media evaluation. Let’s start with expectation. And this is a really good example of how often the conversations around Behavioural Science can quickly get too technical to be applicable. It’s really a very simple thought, but one that is quickly overcomplicated. A little while ago I sat through a debrief in which one of the researchers referenced a study by Esterman and Yantis (see quote pictured above). Picasso managed to sum up the same point more elegantly - what his bull series demonstrates is that the brain is very good and very quick at processing visual information when the essential components fit with our expectations. Even though it has been abstracted and distorted we can still recognise the form of a bull because the core characteristics we expect from an image of a bull are there. Where this gets really interesting, and relevant to brands, is when you consider the flip side. When visual stimulus doesn’t fit with our expectations - because the core structural elements have been too significantly transfigured - even if the context, labelling, surrounding information makes it really clear what we’re looking at, it slows down our processing. And the thing about the human brain is that it is a speed freak. If something is going to take too long to process, 9 times out of 10 the brain will simply tell us to ignore it. If something does not fit with our core expectations we are less likely to notice it. This really calls into question accepted marketing wisdom. 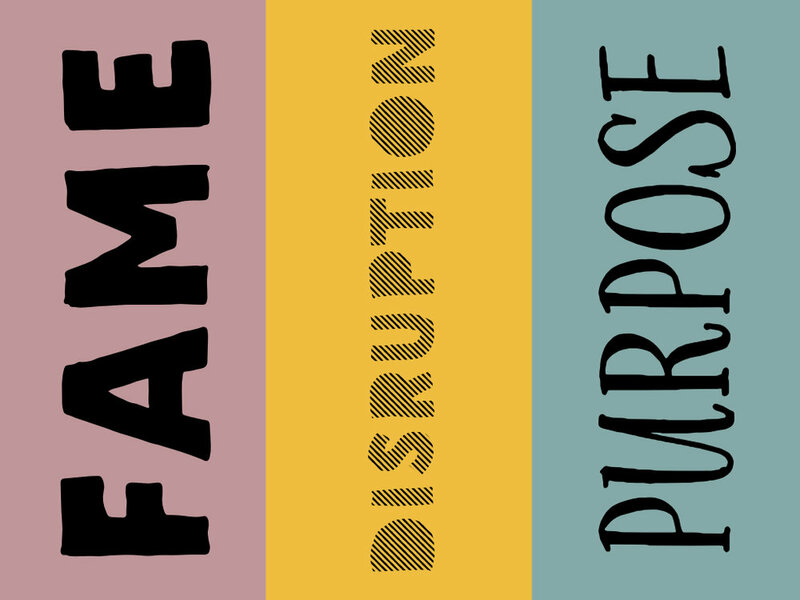 I started my career at BBH, an agency that was built on the notion of disruption. And since BBH kicked it off, the idea that to cut through you need to be different has become dogma within our industry. But is that actually true? Are there times when the brief should be about conformity? The evidence from behavioural science is: yes. Not all the time and not in every aspect of your brand communications. But we need, like Picasso, to identify the structural components of a category and ensure that our brand is always delivering on them. By doing that we can see where we can disrupt and where, if we are to really cut through, we need to conform to expectation. Moving on to Mission. Again, this is an area where there are a huge number of individual biases and theories - inattention blindness, selective attention, visual masking and so on. Once we’ve told our brain that its mission is A - whether that’s reading an article online, buying a bottle of wine, or looking for a tumour in a cat scan - we become spectacularly bad at noticing B. In the example above, Dr Daniel Simons’ dancing gorilla. 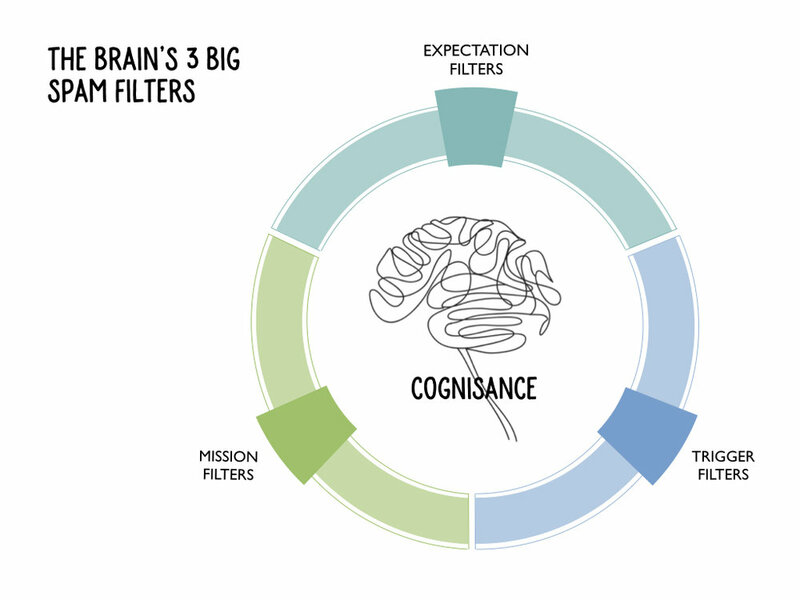 We are hard wired to screen out information our brain deems not relevant to the task. This raises questions around the current industry obsession with programatic buying, exposures and imprints. At the moment, when we talk about cut through it’s increasingly a conversation about media environment - the clutter that sits around our comms. How do we buy media in a way that breaks through that external clutter. In reality - and to be fair this is something those in qual have always said - the external context is far less important to the question of cut through than the internal context of what’s going on inside the viewer’s head. Why do we spot a familiar face in the crowd? Well obviously because it is more familiar. But what that means in terms of what’s going on in your head is that, rather than one or two generic neurones firing up, a whole neurone network - emotions, memories, and connecting imagery - sparks into action. It’s the very fact that more of our brain lights up that triggers our eyes to stop and take in that person in detail. To process them rather than screen them out. And the same is true of objects, we are hardwired to respond more forcefully - to pay more attention - to objects and images with more complex mental association networks. What does that mean for stand out? Simplicity is not always what cuts through. We’ve been indoctrinated into a direct response school of thought that says to cut through the clutter we must strip things back to the most direct, most obvious and most monotone expression of an idea. The reality is, that humans respond to layers. Communications with multiple personal, situational, cultural and social triggers are the ones that our brain will tell us to linger on. 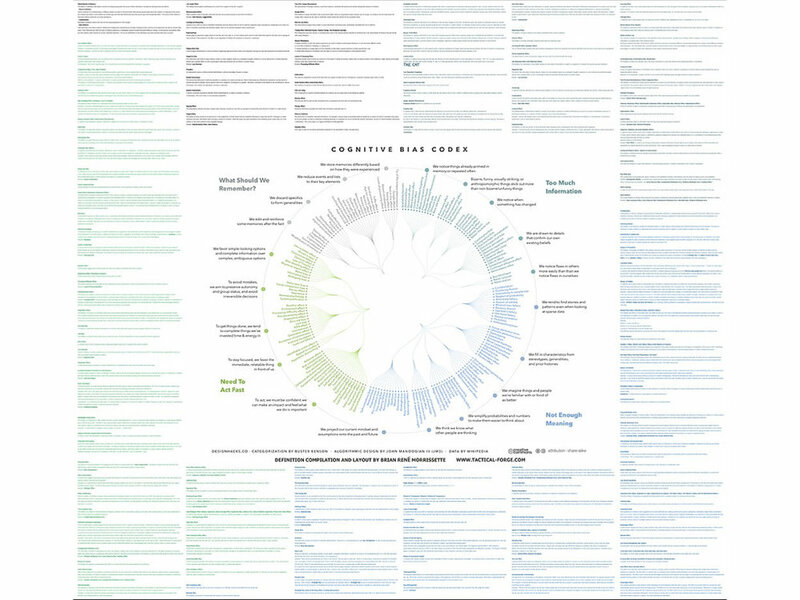 I did have a different image here, but with the enumerate websites that have sprung up in the last week dedicated to trying to decipher Childish Gambino’s immensely complicated and semiotically rich video I thought it was worth referencing it. In terms of how to go about working with this model, it isn’t about obsessing over factoring every dimension to every brief. But rather understanding which are the key filters for the task you are trying to achieve. At the conference I showed how we have put this theory into practice for British Airways and Brancott Estate wine, I can't share them here but if you'd like to hear more I can talk you through them. But the reality there is almost no amount of information or stimulus that we can throw at our consumers that they are not perfectly capable of screening out and ignoring if it doesn’t offer them anything worth paying attention to. It isn’t how much our consumers see that should worry us, but how much they ignore that should humble us. What do you say about the state of your industry when your clients aren't listening? What do you say about the way they commission and what they commission when they're not in the room? The QRCA WCQR is different from other conferences in a few respects. For a start, it has a longer acronym. But it's also a conference designed to enrich and enlighten, not promote. Very few clients get an invite, with the idea that insight and consumer consultants can feel free to share perspectives on what needs changing or challenging within our industry, without worrying about who might overhear. I attended this year as a speaker, on the topic of Behavioural Science and why our industry has been slow to adopt thinking that seems to have gone mainstream everywhere but advertising. There were so many brilliant talks I'm not sure I can pull out the best. So instead here are highlights from the ones where my notes were most legible/ with the fewest spelling mistakes. He wrote a book. Have a read. KEVIN McLEAN & ANDY DEXTER: BREXIT - WHY? The guys from Signoi used a combination of depth interviews and machine learning to demonstrate that we all agree more than we disagree... or that even when we're looking at the same thing we are all seeing it differently. Which you think it is probably depends on how you look at it. The team from Relish Research reminded us that there really is no excuse not to see things from your customer's point of view. Interesting to see emphasis placed on not just speaking with the customer but following their influences. Acacia Avenue also picked up on the need to look beyond classic qual techniques to broader areas of psychology and scientific theory. We already know a huge amount about why people do what they do, but we rarely incorporate it into our thinking. Richard Shotton’s book is a how-to on behavioural science for the marketing community. It’s a book that needed writing. While behavioural science is increasingly put into practice in tech, economics, healthcare and politics, when it comes to comms the concepts have yet to be widely embraced. Sometime it feels as though behavioural science is everywhere but advertising. Odd, given it is effectively the study of what influences people’s decisions... and that’s what we are paid to do. A theme Shotton comes back to throughout is our tendency to treat data as dogma. The assumption that numbers provide surety in a way instinct, intelligent analysis and experience can’t. Of course, they don’t. We all know statistics lie, and yet time and time again we fall for their false promise of simple certainty. His point is best illustrated by the story of Alex Ferguson and Jaap Stam. Opta data showed that his star defence, Jaap Stam, was making fewer tackles each season. Ferguson promptly offloaded him in August 2010 to Lazio - keen to earn a high transfer fee before the decline became apparent to rival clubs. However, Stam’s career blossomed in Italy and Ferguson realised his error - the lower number of tackles was a sign of Stam’s improvement, not decline. He was losing the ball less and intercepting more passes so that he needed to make fewer tackles. When it comes to predicting how humans will behave Data is not a proxy for discretion and judgement. The ad industry is increasingly fixated on the challenges posed by tech and a congested media landscape. We are making a lot of assumptions about how to deal with these challenges… and a lot of the time we’re wrong. The solutions we’re getting to have been driven more by our industry’s obsession with new and shiny, and less by an impartial understanding of human behaviour. Many of the brand behaviours and strategy rules that now dominate our industry - algorithmic ad purchasing, discounting, disruption, demographic segmentation, comms as conversation - are out of step with what we know about how humans make decisions. 3/ The life lesson: how sure do you need to be? Imagine you’re about to cross the road. A 95% certainty that you’ll avoid a car is a dangerously low threshold for action. However, if you’re offered a bet at even odds you shouldn’t insist on anything like the same level of certainty. If you only accepted bets when you were sure, you would miss out on many chances to win. There are costs to not acting, as well as acting. I have a friend who set himself the goal, for one year only, of always saying yes. Whether in business or social situations he decided to see what happened if he agreed to every proposal or suggestion put in front of him. (It’s worth mentioning he didn’t have kids at the time - there is only one answer to ‘can I put the blue smarty in this hole?’). I’m not sure the experiment was as mind-opening as he expected, but on the other hand it didn’t cause as many problems as his friends predicted either. His business didn’t suffer, and nor was he socially exhausted. I think Shotton would have approved. Advertising isn’t life and death. *GASP*. We can afford to take a few more risks when it comes to testing the impact of applying behavioural science to our business, as long as we limit the damage. If you’ve got a theory test it, but test it small. See how it works against one segment of your audience. Play with variables. If something pays off you can scale it up. If it doesn’t, no harm done. We don’t need to be sure that every piece of comms we back is a winner. As the legendary market investor, Charlie Munger, said: "The human mind is a lot like the human egg, in that the human egg has a shut-off device. One sperm gets in, and it shuts down so the next one can't. The human mind has a big tendency of the same sort." We talk a lot with clients about not underestimating the challenge involved in changing a customer’s mind. Repositioning is one of the trickiest briefs there is and it usually requires a far bigger, bolder statement from the brand than clients are willing to make. However much they might say they recognise the need for a radical over-haul it tends to get forgotten when it comes to the crunch. Next time I’ll use the sperm analogy. I suspect it will be remembered. A lot of love gets given to brand fans. Likewise, companies are usually pretty clear on who their rejectors are and why they have been rejected. A lot less attention is lavished on the group in the middle. There’s not even a good name for them; it's usually something along the lines of ‘Light Users’, a heading which provides little insight into how they actually feel about the brand or category in question. Shotton offers a handy model that highlights the importance of this group based on Dominique Jean Larrey's famous approach to treating patients in the Napoleonic wars: Triage. In a similar vein, marketeers should apply a threefold categorisation of their own: those likely to buy regardless of communications, those unlikely to buy regardless of communications, and those for whom communications might make a difference. If we want to spend the comms budget where it will make the biggest difference then marketing should focus ruthlessly on the final category. We're swimming against the tide here, instead of riding the current waves of mindfulness and positive thinking we're going to talk about the refreshing power of negativity. We're all told to focus on being brilliant, on excellence, on being our best selves. We're told we can think our way to success simply by visualising it. But this tsunami of positivity doesn't automatically lead to great work. Sometimes it's worth flipping things on their head to look on the negative side. By reversing the question we uncover hidden assumptions that might be throwing us off. We're essentially saying 'don't be stupid' as opposed to 'try to be brilliant'. Which is helpful because avoiding stupidity is easier than trying be brilliant. The Pre-Mortem imagines that the project or campaign has failed and seeks to understand what went wrong. Asking your team, in the early planning phase, to think of all the reasons a project might fail frees people up to voice concerns they might feel too awkward to say in an atmosphere of bombastic conquer-the-world can-do positivity. Let's look at Bic's For Her pens. Launched around International Women's Day and widely ridiculed for their patronising branding. Had someone asked 'why might pens aimed at women fail', they might not made such a hash of it. If you’re having a bad day and need a laugh then have a read of the ensuing amazon reviews. This is a good way to nail the nitty gritty. Looking at all the reasons your customer experience will fail forces you to face up to the big things that make most of these experiences bad for customers, as opposed to just tweaking around the edge to make a better version of the last thing you did. We've run sessions where we map out potential fails for catalogues, digital properties and in-store experiences. We then work through the priority scenario's and determine the brief for overcoming them. Simple but effective. To stand the best chance of solving a problem we need to think both forwards (positively) and backwards (negatively). Whilst one helps us be brilliant, the other stops us making stupid mistakes. Which - in this era where thinking comes a poor second to doing and the pervasive rhetoric is around sprints, being lean, failing fast (etc etc etc) - is something we can all do with. We share the strategic tools and techniques from our Methodbox on a monthly basis via email, to receive them straight to your inbox sign up to our newsletter right at the bottom of the page. Whilst we don't believe you can form-fill your way to great creative work, we do believe in discipline, in asking yourself the right questions to get to under the skin of an issue. Proposition / core idea / springboard / comms idea. Whatever you choose to call those selection of words that sit at the centre of brief, they are what allow you to create a campaign that is multi-channel, multi-market, multi-platform, multi-agency. The creative used to express them may differ but the core thought remains. Behind every great idea there is firm strategic scaffolding that lifts thinking above the mediocre, to help it scale the heights. 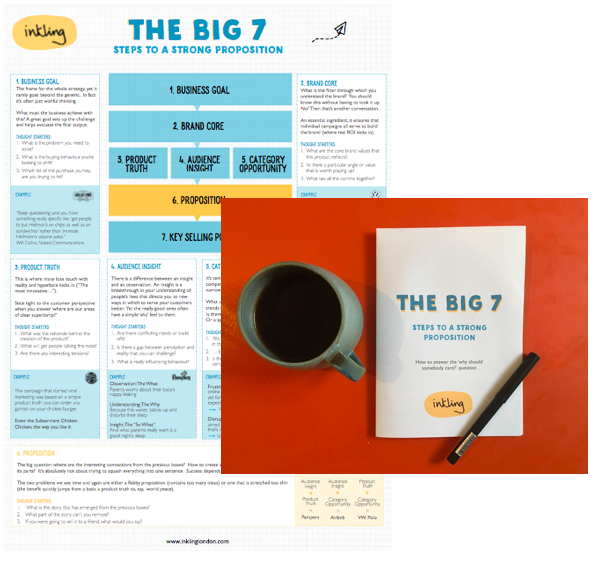 To that end we decided to take our full methodology for getting to strong propositions and condense it into a planning sheet, a lovely printed copy that can be taken to meetings, on the train, to the bathroom. The first 30 people to email louise@inklinglondon.com with their postal address will get a copy mailed directly to them. Along with an abundance of Easter eggs and daffodils, Spring brings a new planning cycle for many. At Inkling, a lot of clients conversations have been around the challenges of making plans when there's so much category disruption in the air. But the trick to dealing with change is to start with what stays the same. When a category is in flux every little shift can seem like a revolution. Yet underneath most big shifts are enduring needs that alter little over time. What does change is the cultural or technological context through which people decide what best meets those needs. To understand how to respond to those changes you need to know what sits behind it. With just two questions this month’s tool looks deceptively simple. But don’t underestimate it, it's the simplicity that forces you to disentangle what is genuinely new (the fluid) from what is enduring (the solid). Because it’s this ability to give space to the new without letting it crowd out what was ever thus that ensures a brand stays in step with it’s audience. E.g. What shall I watch tonight? The below was developed for a broadcaster who was interested in how the changing technological landscape was affecting how people choose what to watch. A filter through which to view new trends, new technologies, new behaviours. - Is this technology really the future or is it a fad? - Will a new competitor come and go or will they crush my business? - Where do I concentrate my efforts (and budgets) to better serve customers? Phrasing the question: write it as a consumer would, not as a business. This ensures you remove any insider assumptions about what's important in the category. What's solid: think about the needs that haven't changed across generations, what were the drivers when this category/topic first came into existence? What's fluid: what are the social / cultural / technological changes that have or could rewire our expectations or allows us to start prioritising some needs over others. To get Methodbox tools delivered straight to your inbox sign up here. AA Gill on gold miners: “...their job wasn’t actually mining for gold, it was removing everything that wasn’t gold”. There are maxims on the supremacy of simplicity from the big hitters in every field, from Da Vinci to Isaac Newton to Chopin. Whilst such lofty sentiments give us something to aim for they’re not much cop when it comes to the question of ‘how do I get there?’. "...once you get there (simplicity) you can move mountains." To move mountains - that’s what we’re all trying to do. Whether it’s the artist seeking to move the human spirit. Or scientists trying to shift the course of understanding. Or (at the more practical end of the spectrum..) those of us in the commercial world seeking to accelerate companies past their competitors. Conveying an idea simply channels its power and if you’re going to move mountains you need some serious power. BUT HOW TO ACHIEVE SIMPLICITY? Let’s tackle this in reverse, not how do we make things more simple but rather what is making things complicated. Why does thinking get muddled? What makes the work convoluted? From this angle it’s a relatively short hop to get to a skill that feels overlooked. The ability to edit. Really edit. It feels a bit lacklustre doesn’t it? Not particularly shiny or exciting (it certainly wouldn’t make for a memorable quote). “...their job wasn’t actually mining for gold, it was removing everything that wasn’t gold”. “Max Lieberman (the German impressionist) said that the art of drawing was the art of omission. It’s a pensee that I use more often that any other borrowed quote. It’s a powerful truth of life. What you leave out gives power to what is left in”. But getting there is anything but. Which is where the writers come into their own, because writers, being the very kings of editing, are full of practical advice. Here are 3 traps that they’ve brought to my attention, ones that I find myself and others fall into again and again. Trap 1. The Effort Trap. “Every year the aspiring photographer brought a stack of his best prints to an old, honored photographer, seeking his judgment. Every year the old man studied the prints and painstakingly ordered them into two piles, bad and good. Every year the old man moved a certain landscape print into the bad stack. Why do you like it so much?” The young photographer said, “Because I had to climb a mountain to get it”. For Dilliard what something cost you personally, has no relevance to the reader/viewer. We know we’re supposed to kill our darlings but we just don’t do it often enough - or quickly enough. That stat that you found by searching every last document on the system late into the night, which made you miss (delete as appropriate) that great night out / a good night’s sleep / the last train home. But it’s skewing the story now. You can’t quite link it back to main point. Be courageous, cut it free. The sentence you’ve been tweaking for days, until you got it word perfect. But the idea has moved on and it doesn’t quite fit. Now it’s weakening the work not strengthening it. It’s got to go. That idea that you’ve managed to get past 4 different teams of stakeholders, but it’s got a bit bruised in the process, you’re not entirely sure it works anymore. Time to wave it goodbye. Trap 2. The Let’s-Free-Ourselves-From-Process Trap. This ones is a biggie and it has emerged from a cultural shift in the way we do marketing. We’ve been so throughly put off by the laborious end-to-end marketing processes of the ‘90s and ‘00s, complete with their 80 page manuals and do-not-pass-go rigidity that we’ve done a full 180°. In order to set creation free in the marketing world, process has been abandoned in favour of free-form collaborative thinking. Everyone pitching in. No fixed order. The best ideas will rise to the top. But a useful side product of all that process was the discipline, the filtering system through which excess clutter gets stripped away and the singular focus held firm. I’m not suggesting a return to straight-jacketed days of process-led marketing, but I am suggesting a dispassionate look at flaws of the the free-for-all approach that defines the working culture of many agencies and client organisations today. The muddle that often emerges out of the other end: lots of bitty ideas that don’t quite add up to more than the sum of their parts. The question then becomes what can we keep fluid and where do we need to reassert the discipline. From my experience, working both in and with the full gamut of agencies from digital to brand strategy, comms planning to creative - the first thing to disappear in today’s just-do-it culture is a tight strategy that everyone is bought into: a definition of the problem that you can solve, identifying the approach to tackle it and then marshalling all the resources in the same direction. The basics, basically. As Gill observes, we need the craft (the skilled strategic thinkers) to help get us to the art. Where we start is just where we start. It shouldn’t be where we end up. See Picasso’s image that Apple use to train staff. Picasso starts with a realistic picture of a bull, and over a series of 11 images hones it down, identifying the edges and elements which give the bull form. It ends with him removing everything extraneous, finding the simplest outline that still communicates bullness. Strategists are the scaffold builders, we build the framework upon which the creative work can then flourish. And because the strategist often feels judged more on the strategic output than creative output it can be hard not to show everyone just how clever all of your thinking is: the stats, the studies, the quotes. 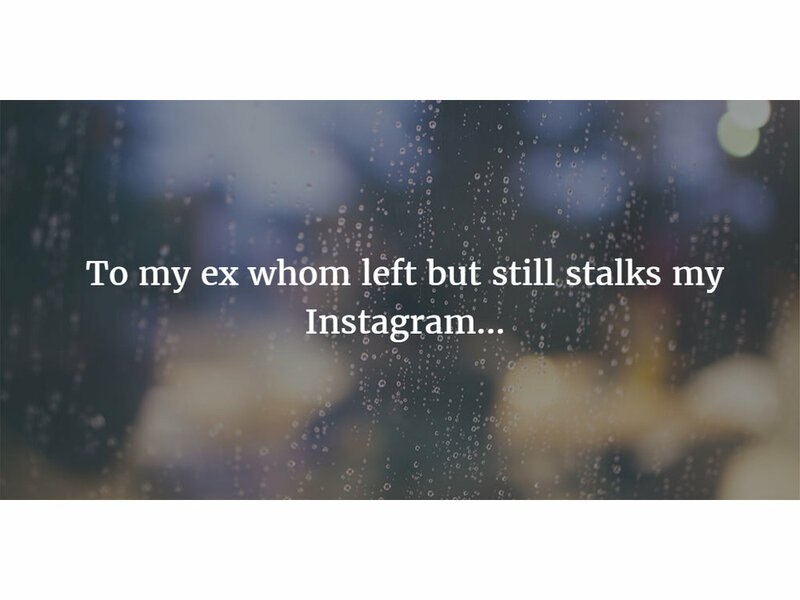 But they’re how you got there, not where you ended up. If you removed them what would happen? Imagine two stories, one told with lots of words, many of them long, many of them descriptive. The other written sparingly, the key parts given time and space to resonate. Which do you think would connect with you more? The skill is to identify what is just scaffolding and what is the brick work. Find the edges. Protect the edges. Remove the rest. Let the receiver fill in the blanks, that’s where the power will lie. Chapter 1. Page 1. 2017. January is the month that offers us all the chance to bring a little reflection into our non-stop lives. But the need to power up and hit the ground running can mean any gentler inclinations towards self analysis get shut down before we’ve had a chance to do anything with them. But that’s a shame. Because, as the old adage goes, if you aim at nothing, you’ll hit it. Our January tool is here to help you grab hold of those introspective moments - to pull the year into focus and think about what you would really absolutely like to get out of it. So make yourself a cup of something tasty and work through these simple questions that will help you find that strong opening sentence to 2017. In a bid to help companies work fast but without compromising quality, we've been assembling our MethodBox: a kit of tools and techniques, created and curated by Inkling that helps get to the nub of an issue fast. Some open up our perspective, others filter it down. Some are for groups, others for individual pursuit. All of them bring focus and help us maintain momentum. We're going to share a different tool every month (sign up on the Methodbox page to receive these straight to your mailbox). First out of the box is the Feature Filter, a tool to kick the tyres of your product. Too often products become a conglomeration of features, but instead of thinking more = more we need to fine tune the overall offering: the right balance of features, for the right price, for the right customer. 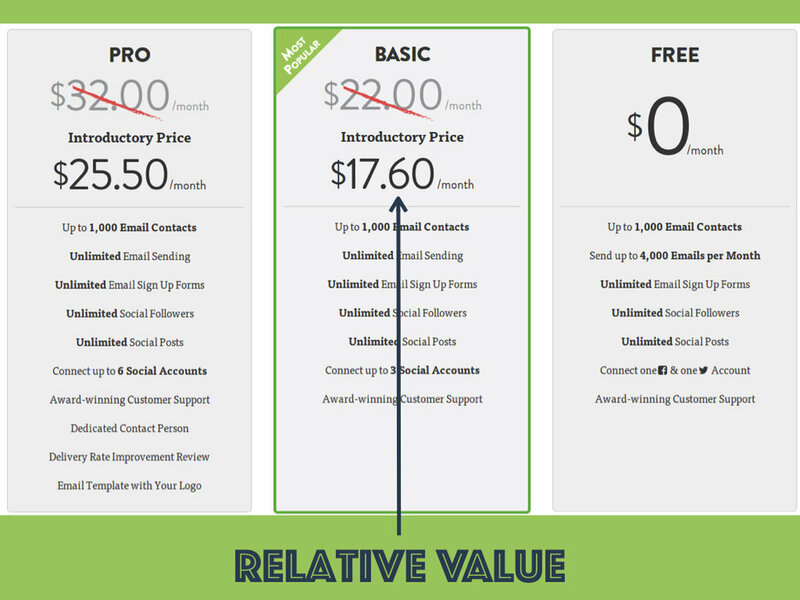 Benchmarking your features against competitors' is relatively straightforward. Likewise, there's no shortage of ways to find out what customers think of your product. But to see how to compete you need to be able to pull these two things together. By creating a structure for examining the category feature-set through the eyes of the consumer this tool allows you to do just that. The key to making this work is to fill it in using real customer data, not to lean on internal assumptions about what people want. Get in touch if you'd like to know more about the process we go through and specific pointers for getting it right. 1/ When you beat the competition hands down on Leader features why are your products still not selling? This tool helped our client demonstrate to their tech team that failure to deliver Expected features was holding the brand back. 2/ A brand whose positioning was failing to cut through found marketing had been over-emphasising Expected features and customers weren't aware of the Extras. The filter helped demonstrate to the wider team the need to shift messaging focus. 3/ For a mature FMCG brand this revealed the reason behind their loss of premium positioning: a quickly shifting category meant features that were once Leadership material had filtered down to become minimum expectations. They channeled their energy into innovation. Stay tuned for next month's delve into the MethodBox. We'll be sharing a technique that helps get a handle on the hairy topic of getting growth, fast. Get in touch if you've got a good tool you'd like to share: we're always on the look out for smart ways to get to the nub of the issue. Equally, if you have a go at putting this one into practice then let us know how you get on.